Rupert Murdoch is a patient hunter. Eleven years ago, when I was running my hedge fund, he called me in to talk about acquiring Dow Jones, the company that, as you may have heard, he’s once again interested in buying. Right before he called, I had taken a 4 percent position in Dow Jones and tried to be a shareholder activist—I was convinced the company could make more money from The Wall Street Journal, its crown jewel, and from its Dow Jones newswires. I say “tried” to be an activist because Dow Jones was never really run like a company; it was run more like a vast college newspaper, bent on maintaining journalistic integrity regardless of the business implications. The idea of turning a profit, even as a side benefit, was too sinful for the ultrarighteous management or the clueless-but-revered Bancroft family, which controlled the company through a supermajority stake. Neither contingent was about to listen to a pip-squeak shareholder who actually thought you could make a profit and put out some decent journalism. I remember speaking passionately at the annual meeting about the need to make prudent changes before the losses cut into the Journal’s journalistic integrity. Peter Kann, the chairman and CEO at the time, dismissed me with a laugh. No matter. While agitating, I had attracted Murdoch’s attention as someone who seemed to understand the worth of Dow Jones as a great brand. He summoned me, through the late Eric Breindel, the New York Post’s editorial-page editor and an old college pal, while I was vacationing with my family at Hershey Park. It was a Sunday morning. Breindel said Murdoch wanted to meet as soon as possible. I explained that I was with my family, but Breindel insisted I come as soon as I could. Murdoch was obviously serious. When we met, the man asked me what I thought Dow Jones was worth. At the time, the stock was trading in the mid-30s. I said the franchise could be worth $73 to $74 a share. Before I could even present my backup, I remember him saying, “I’ll pay that.” No blinking—$40 more than the stock was trading at. He even talked about the possibility of getting a line of credit from Chase to do the deed. I told him that the family had no desire to sell, and that the family’s law firm might not even show a bid from him to the Bancrofts. He sneered and informed me that one day they would. On May 1, Murdoch made a surprise bid for Dow Jones of $60 per share, or about $5 billion. Eleven years after our meeting, the hunter had come back for his prey. And from the looks of things, he might get it, and for much less than he was willing to pay back then. No, the Bancrofts still don’t want to sell to him, but much has changed, most of it of Dow Jones’ own doing, and the chance to stay independent has now been squandered. First, while Dow Jones, the average, has more than doubled since my Murdoch meeting, Dow Jones, the stock, has done almost nothing during that time. That’s a point-blank indictment of management. Few groups of companies have grown faster than those that provide data and information services to all the hedge funds, mutual funds, and brokerage firms out there. But Dow Jones hasn’t kept pace with the other Joneses. While Dow Jones stood still, Bloomberg, the company, ate into Dow Jones’ bond-reporting business and then outflanked the Dow Jones wire service, one of its most profitable units. Michael Bloomberg had worked at Salomon and knew what the institutions wanted. I recall him schlepping to my old office seeking to sell us a Bloomberg terminal for our newly minted hedge fund. We wanted a half-dozen different data feeds and analysis; he said, “Done.” The journalists who ran Dow Jones didn’t even see the threat coming. Now neither hedge funds nor mutual funds count the Dow Jones newswire as a primary news service, and Bloomberg has become indispensable. Until about a month ago, the Dow Jones wire was an acceptable backup to Bloomberg, so it kept up a decent business. But in the time since Murdoch launched his bid, there’s been a major change in the landscape. Reuters, the third newswire, is merging with Thomson, a terminal purveyor. Thomson’s got a long-term perspective. It would not shock me if it offers Reuters for free to all the funds out there that use Dow Jones if they take the Thomson trading box. Squeezed on the high end by Bloomberg and the low end by Reuters-Thomson, the prospects for the wire, the only cash cow Dow Jones has left, seem bleak. A second part of the changed landscape makes Murdoch’s bid even more imperative: the announcement that News Corp. is opening a competitor to my employer, CNBC. Don’t expect a competing bid for Dow Jones from CNBC or anyone else for that matter. Only Murdoch needs the Journal and Dow’s other businesses. Despite the rejection by the professionals, the public still regards the Journal as synonymous with business news. Murdoch can afford to pay $5 billion if he thinks it can help bring in advertisers to his new station because purveying financial news on TV, unlike print, is still a huge moneymaker. Then, there’s the main reason why I think Murdoch wants the Journal: He loves the editorial page. In fact, he’s gaga over it. That was one reason he gave me back in 1996, and that’s one reason why he wants it now. I think he would like to elect a president, Kane style, with it. Initially, of course, the family opposed Murdoch’s bid. What made them turn? I think a couple of realities dawned on them. The economics of the news business have gotten so bad that any protestations about journalistic integrity seem hollow. There’s no faster way to compromise the journalism than to run out of money. Another reality? The Journal’s been fabulously successful at getting people to migrate from its print version to its electronic one. The digital Wall Street Journal is the most successful paid newspaper site in the world. But every customer who moves from print to electronic hurts the bottom line. Print’s more lucrative even as it dies than the Web is as it thrives. The advertisers just won’t pay as much for digital display as they will for broadsheet. I also believe that the older Bancrofts, well represented on the board, and Michael Elefante, the trustee for the family, both must have recognized that they could be sued—perhaps successfully—by the younger Bancrofts for a dereliction of their fiduciary duty if they didn’t at least explore Murdoch’s offer. Dow Jones’ stock price would be cut by two-thirds if Murdoch walked away. The stock resided in the 30s, not the 20s, before the bid because there was always the hope of a takeover. You reject Murdoch, you reject any bid for all time. The older Bancrofts found themselves in a box—or a trap, set by Murdoch. Finally, the only successful, growing public journalism entities also have television stations to buoy them (Gannett and Belo, for example) or are part of larger conglomerates (Money and Fortune to Time Warner and BusinessWeek to McGraw Hill). Dow Jones has no side business that can throw off that kind of cash. Perhaps the old guard is facing up to that. So, what would a News Corp.–run Dow Jones look like? Murdoch’s much more a visionary about the Web than people give him credit for, and that means he can better monetize Dow Jones’ news content than any other media entity could. An organization that had the vision to pay $580 million for MySpace might be able to ungate the paid Wall Street Journal Website and get hundreds of millions of dollars more in advertising globally. A paid site can’t generate anywhere near the eyeballs that a free site produces, and advertisers covet viewers. The additional ad revenue would dwarf the subscription fees, which are puny to begin with. Dow Jones hasn’t been able to afford to go free without corrupting the price of the print publication. News Corp. could care less about that. 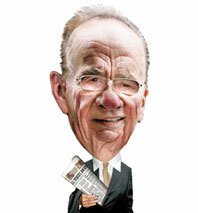 Will Rupert dumb down or slant the Journal’s news coverage? He’s certainly no fan of long-winded stories. And he might even find clever ways—through an ombudsman, say—to dial back on what he perceives to be negative stories about China. That said, I don’t think Murdoch will do anything that fundamentally tarnishes the brand. He knows that’s a bad business strategy, and he plain-old relishes the Journal too much. In our meeting eleven years ago, Murdoch spoke lovingly of how much he enjoyed reading the paper cover-to-cover. I can’t help but believe that some of the hands-off Bancrofts, on the other hand, don’t even bother to read the darned thing. If they did, maybe they would better understand how difficult it is to generate quality journalism in the face of ceaselessly declining fundamentals. Anything can happen with a deal this high-profile and this complicated. The Bancrofts could decide not to sell, or other purchasers could emerge. But as I write this, I believe Murdoch has the inside track to get this deal done, probably with some tweaking to please the more recalcitrant board members. Murdoch was willing to pay $74 a share more than a decade ago. Today, the company is more vulnerable, and he can get it for less. This time, he won’t be denied.